Based on our rather dashing Sca Fell Peak hat we give you Jeremy, a super-cute peaked cap for babies and toddlers. In these colours Jeremy is rather masculine, but you could make a lovely girly Jeremy in Ivory with a pink and cream pompom or with a pink bow instead. Tension: 21 sts and 27 rows to 10cm over stocking stitch in the round on 4mm needles. 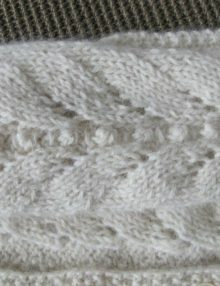 Tension for band: 18 sts and 36 rows to 10cm over garter st in the round on 4.5mm nds with yarn held double. Finished size: 33(37, 41.5)cm / 12½(14½, 16⅓)”. 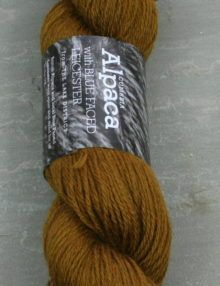 Yarn: Town End Pure Natural DK Alpaca, or Thames Alpaca Blend DK. Single colour hat: 1 x 50g ball. 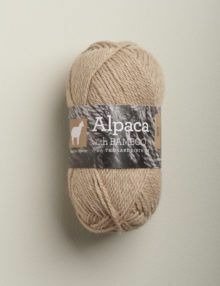 4-colour hat: 1 x 50g ball of each colour, shown in Dark Fawn, Ivory, Light Mid Fawn and Pewter. 4mm and 4.5mm dpns / circular needles, OR the size required to give you the correct tension. 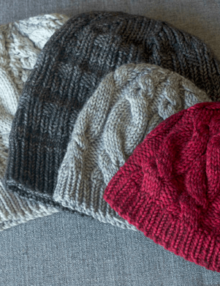 It might be easier to knit the Peak on straights or circs, but the rest of the hat is entirely up to your preference for knitting small diameters in the round. 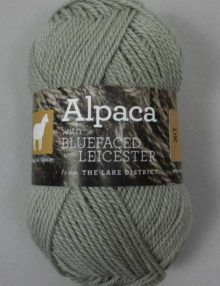 Your preferred needle / latch hook for darning ends in. A vintage-y baby blanket, reminiscent of the cellular woollen blankets of the 60s and 70s. 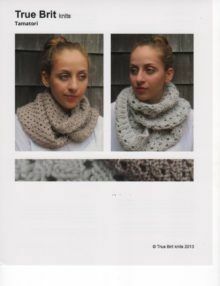 Knitted in individual squares and then knitted together, there is no seaming to do and you only have ends to darn in. i-cord border is optional, but does give a nice ‘finished’ finish. Tension: 17.5 sts and 35 rows in garter stitch to 10cm on 4mm needles. Finished size: 75cm (29½”) square. 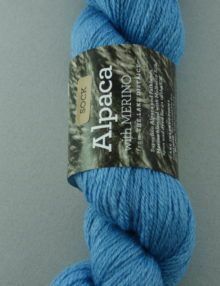 Yarn: Town End Alpacas 100% Alpaca DK . 8 x 50g balls. Shown in Light Fawn. 4mm with 4.5mm circular needles for joining and a spare dpn (or two) for the option i-cord edging, OR the size required to give you the correct tension. 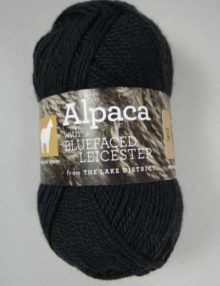 Your preferred needle / latch hook for darning ends in. 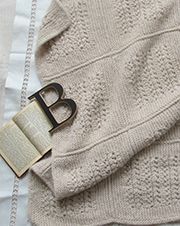 Blackett is suitable for boys or girls, a classic, textured cardi in moss st, garter stitch and a fleck stitch, again with a slightly vintage feel. 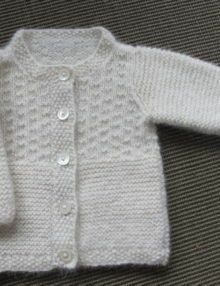 Sizing: Five – to fit ages 2(3, 4, 5, 6) years, actual chest size: 64(68, 73, 78, 82)cm / 25(26¾, 28¾, 30¾, 32¼)”, buttoned. 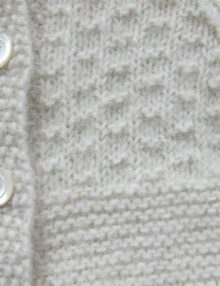 Tension: 16.5 sts and 33 rows to 10cm / 4” over garter stitch (every row knit). 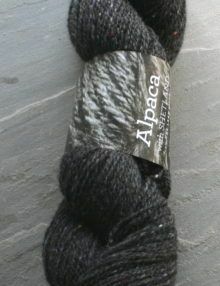 Yarn: Town End Alpacas Alpaca with Shetland Aran, 90% Pure Alpaca, 10% Shetland Wool, 74m(80yds) / 50g ball. 5(6, 6, 7, 7) balls, shown in Ivory. 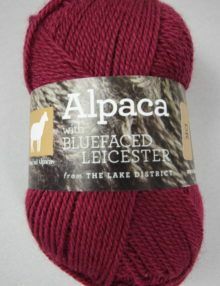 OR Town End Alpacas Pure Alpaca Aran, 100% Pure Alpaca, 66m(71yds) – 82m(88yds) / 50g ball (metreage is dependant on colour, yarn quantities given for lowest metreage available) 5(6, 6, 7, 7) balls. Buttons: 5. Ours were 2cm diameter. Pattern is written, with spec drawing for easy mods. 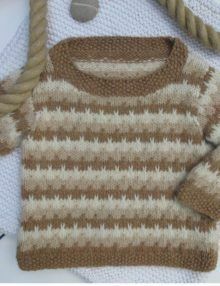 Sizing: To fit age 2(3, 4, 5, 6) years. Actual size 64(68, 73, 78, 82)cm / 25(26¾, 28¾, 30¾, 32¼)”. Tension: 17.5 sts and 26 rows to 10cm over stocking stitch after washing / blocking. 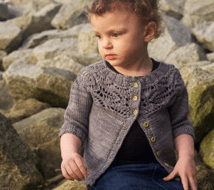 The Walker Cardigan is more feminine than the Blackett Cardigan, a classic, slightly lacy cardi in moss st and a leafy lace with a few bobbles thrown in on the sleeves. We like to think that the Walker girls would have been dressed in similar cardis when they were dreaming of being explorers in the Lakes aboard the Swallow. 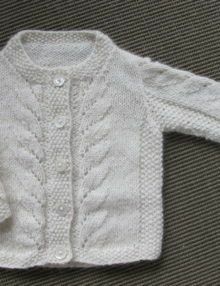 The bobbles are very easy, as is the leafy lace pattern on the fronts and the sleeves. Tension: 17.5 sts and 24 rows to 10cm / 4” over stocking stitch. 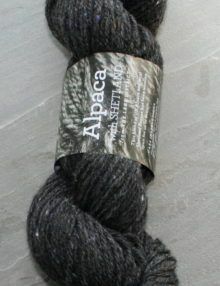 Yarn: Town End Alpacas Alpaca / Shetland Aran, 90% Pure Alpaca, 10% Shetland Wool, 74m(80yds) / 50g ball. 5(6, 6, 7, 7) balls, shown in Ivory. 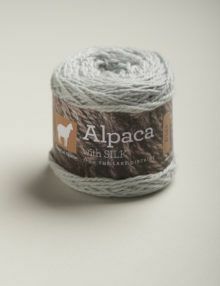 OR Town End Alpacas Pure Alpaca Aran, 100% Pure Alpaca, 66m(71yds) – 82m(88yds) / 50g ball (metres are dependant on colour, yarn quantities given for lowest meterage available) 5(6, 6, 7, 7) balls. Buttons: 5. Ours were 2cm diameter. 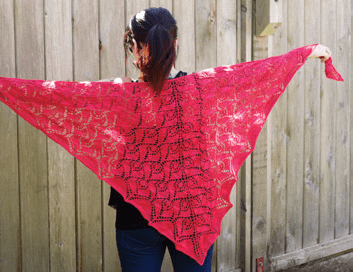 Ishbel is a simple shawl pattern that can be worked in two sizes and two different yarn weights. 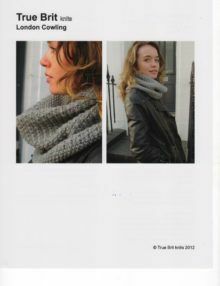 The smaller, 4ply version makes a cosy, but pretty scarf while the larger, 2ply version can be worn as a scarf or draped elegantly around the shoulders. 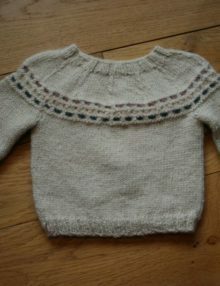 The solid stockinette centre lends simplicity to the design and adds extra warmth when knitted in thicker yarn. 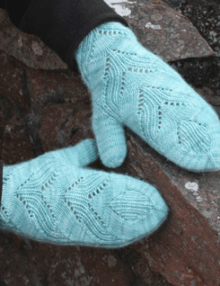 Ishbel is edged with a beautiful vine pattern and finished with elegant scalloped points. 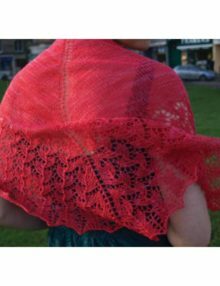 The shawl begins at the centre and is worked outwards to the edging. 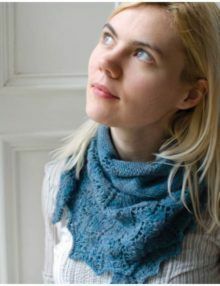 working increases at both ends of every row, rather than every second, creates a relatively shallow triangular shawl that makes the perfect shape to wear as a scarf. Either size can of course be worked in either yarn weight. The small version is approximately 123 cm wide and 37 cm long at the centre. 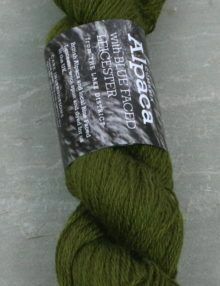 It takes two 50g balls of Town End pure 2ply or 4ply alpaca, or one skein of our sock weight yarn. The larger version is approximately 168 cm wide and 50 cm long at the centre. 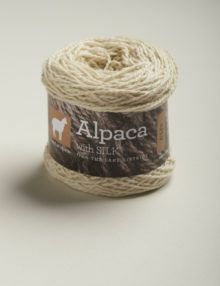 It takes three 50g balls of Town End pure 2ply or 4ply alpaca. 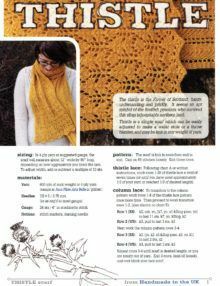 Thistle is a simple and classy scarf which can be easily adjusted to make a wider stole or a throw blanket, and may be knitted in any weight of yarn. 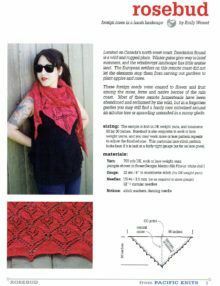 Sizing: In 4-ply yarn at suggested gauge, the scarf will measure about 12” wide by 80” long, depending on how aggressively you block the lace. To adjust width, add or subtract a multiple of 10 sts. 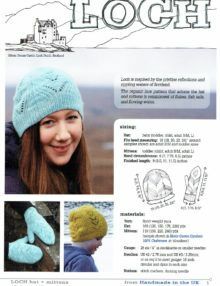 The lace patterned hat is knitted in the round using 4ply yarn The mittens are also knitted in the round from cuff to fingertip. 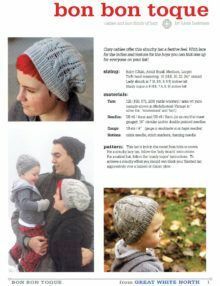 Sizing: Hat: baby (toddler, child, adult S/M, L) Fits head measuring: 16 (18, 20, 22, 24)” around. 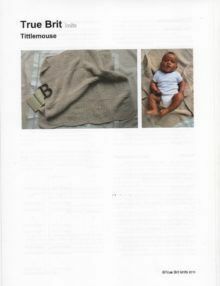 Photos shown are adult S/M and toddler sizes. A lace stitch patterned beret in DK yarn. 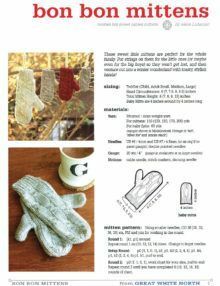 These sweet little mittens are perfect for the whole family. 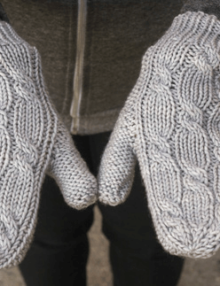 Put strings on them for the little ones (or maybe even for the big boys) so they won’t get lost, and then venture out into a winter wonderland with toasty, stylish hands! 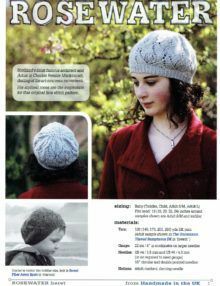 This is a cables and lace family of hats by Alexa Ludeman. Cozy cables offer this slouchy hat a festive feel. 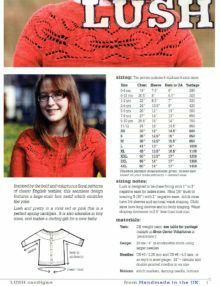 With lace for the ladies and texture for the boys you can knit one up for everyone on your list! 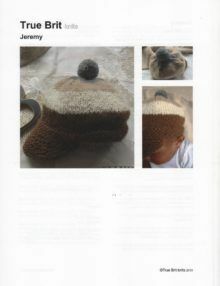 Pattern: This hat is knit in the round from brim to crown. 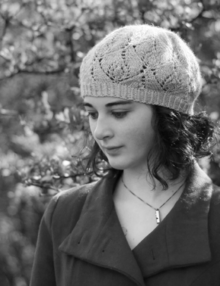 For a slouchy lacy hat, follow the ‘lady slouch’ instructions. 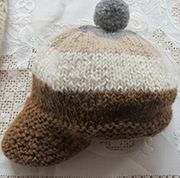 For a cabled hat, follow the ‘manly toque’ instructions. 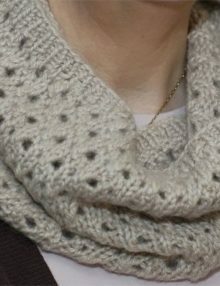 To achieve a slouchy effect you should wet-block your finished hat aggressively over a balloon or dinner plate.